We see today that there is a growing understanding in the international community that the extremist regime in Tehran is not just Israel’s problem, but rather an issue that the entire international community must grapple with. For this reason, the expansion of relations with all countries is on the agenda of the Islamic Republic of Iran. I mean balanced relationships, based on mutual respect and observation of each other’s rights. People should have freedom in their pilgrimages and tours. They should come and visit historical monuments and sites – let’s say the sites around Iran – where they can easily engage in wide- scale contacts with others. Our enemies can deal a blow to us any time they wish. They did not wait for permission to do this. They do not deal a blow with prior notice. They do not take action because they can’t. The United States’ administrations… must recognize that Iran is a big power. Having said that, we consider ourselves to be a human force and a cultural power and hence a friend of other nations. We have never sought to dominate others or to violate the rights of any other country. 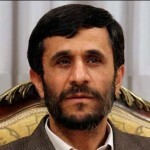 Mahmoud Ahmadinejad is an Iranian politician who was the sixth President of Iran from 2005 to 2013. He was also the main political leader of the Alliance of Builders of Islamic Iran, a coalition of conservative political groups in the country.